Spring is officially here in a couple of weeks and that means the grill is coming out from under the cover. Summer will be here before you know it. 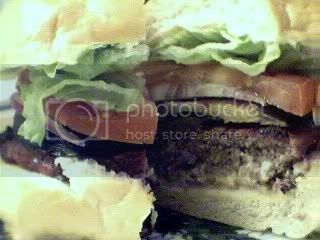 My hubby and girls love homemade hamburgers, and I think we have come close to perfecting this just the way we like it. It is basically a meatloaf mixture, but for some reason when cooked as meatloaf, my finicky family just refuses to eat it. Shape it into patties and put it in a bun and they are in heaven. Go figure! Mix all the ingredients until well mixed and form into patties. Grill or pan fry to your preferred doneness. Having to cook everything on the well done side for the kids, hubby and I have slowly moved from the medium to the done side too. The good thing about this mixture is that it stays moist even when well cooked. am here again to get the recipe! oppppsss…why did I missed this one???? great combo with Jade’s melon smoothie…yummy! oh, thanks for this recipe, jmom! hubby and kids will surely like this!